Fragments of fossil Keratoisis melitensis (Goldfuss, 1826) from the Lower Pleistocene of Cape Milazzo, Sicily, Italy. Bamboo coral, family Isididae, is a family of mostly deep-sea coral of the phylum Cnidaria, class Anthozoa, and subclass Octocorallia. It is a commonly recognized inhabitant of the deep sea, due to the clearly articulated skeletons of the species. Deep water coral species such as this are especially affected by the practice of bottom trawling. These organisms may be an important environmental indicator in the study of long term climate change, as some specimens of bamboo coral have been discovered that are 4,000 years old. Relatively little is known about bamboo coral. 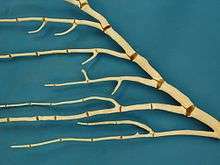 The skeletons of bamboo coral are made up of calcium carbonate in the form of tree-like branches alternating with joint-like nodes or axes composed of gorgonin protein. The alternation of the bony structures with the smaller gorgonin parts give the bamboo coral a finger-like appearance similar to that of the bamboo plant on land. 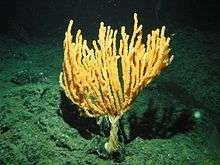 Bamboo coral was reported in 2005 to have been found on a dozen seamounts in the Pacific Ocean between Santa Barbara, California, and Kodiak, Alaska. Although the ages and growth rates for most deep water coral are not yet available, specimens of bamboo coral found in the Gulf of Alaska have been estimated to have a life span of 75 to 126 years, based on radiocarbon-based growth rate and age data. Recently, a mission funded by the National Oceanic and Atmospheric Administration (NOAA) discovered seven new species of bamboo coral in the Papahānaumokuākea Marine National Monument, a U.S. National Monument lying primarily in deep waters off the Northwestern Hawaiian Islands, using the Pisces V. Of these seven new species, six may represent completely new genera (that is, major new classification categories). Data from these findings are still being analyzed. A bamboo coral "tree", five feet tall, was described for the first time by the mission. Scientists also found an area of dead coral, about 10,000 square feet (930 m2) and more than 2,000 feet (610 m) deep. The cause of death of the coral community is unknown but it is estimated to have occurred several thousand to perhaps over a million years ago. Deep sea bamboo coral provides the ecosystems to support deep sea life and also may be among the first organisms to display the effects of changes in ocean acidification caused by excess carbon dioxide, since they produce growth rings similar to those of a tree and can provide a view of changes in the condition in the deep sea over time. Some bamboo coral can be especially long-lived; coral specimens as old as 4,000 years were found at the Papahānaumokuākea Marine National Monument, giving scientists a window into the ocean's past. One scientist said the coral provided "4,000 years worth of information about what has been going on in the deep ocean interior". Deep water coral organisms such as bamboo coral are especially affected by the practice of bottom trawling. Other research has raised the possibility that Isididae corals, because of their potential to mimic biological properties, may potentially be used as living bone implants as well as in aquatic cultivation. ↑ "Isididae". research.calacademy.org. Retrieved 2009-05-11. ↑ "Deep-Sea Corals Portal". www.ull.edu. Retrieved 2009-07-08. ↑ Scott C. France (2007). "Genetic analysis of bamboo corals" (PDF). Bulletin of Marine Science. 81 (3): 323–333. 1 2 "National Oceanic and Atmospheric Administration – New Deep-Sea Coral Discovered on NOAA-Supported Mission". www.noaanews.noaa.gov. Archived from the original on 9 May 2009. Retrieved 2009-05-11. ↑ Peter Etnoyer. "NOAA Ocean Explorer: Exploring Alaska'a Seamounts". www.oceanexplorer.noaa.gov. Retrieved 2009-05-11. ↑ "Isididae – GBIF Portal". data.gbif.org. Retrieved 2009-05-11. 1 2 3 H. Ehrlich; P. Etnoyer; S. D. Litvinov; M. M. Olennikova; H. Domaschke; T. Hanke; R. Born; H. Meissner; H. Worch (2006). "Biomaterial structure in deep-sea bamboo coral (Anthozoa: Gorgonacea: Isididae): perspectives for the development of bone implants and templates for tissue engineering". Materialwissenschaft und Werkstofftechnik. 37 (6): 552–557. doi:10.1002/mawe.200600036. ↑ "New Isidella bamboo coral". X-Ray International Dive Magazine. www.xray-mag.com. Archived from the original on 31 March 2009. Retrieved 2009-05-11. 1 2 "The Deep Sea Conservation Coalition – Press Release". www.savethehighseas.org. Archived from the original on 27 April 2009. Retrieved 2009-05-11. ↑ E. B. Roark; T. P. Guilderson; S. Flood-Page; R. B. Dunbar; B. L. Ingram; S. J. Fallon; M. McCulloch (2005). "Radiocarbon-based ages and growth rates of bamboo corals from the Gulf of Alaska" (PDF). Geophysical Research Letters. 32 (4): L04606. Bibcode:2005GeoRL..32.4606R. doi:10.1029/2004GL021919. ↑ "Discovery – 7 New Species Of Bamboo Coral Near Hawaii". www.scientificblogging.com. 2009-03-05. ↑ "New species of bamboo coral identified off Hawaii". www.samoanewsonline.com. Retrieved 2009-05-11. ↑ L. van Ofwegen (2011). "Isididae". World Register of Marine Species. Retrieved January 17, 2012. Wikimedia Commons has media related to Isididae. "Classification of Family: Isididae – GBIF Portal". data.gbif.org. "Discover Life – Gorgonacea: Isididae". www.discoverlife.org.